Whether you’re working at a construction site, landscaping a development or hauling resources for your material handling company, Caterpillar® utility vehicles are what you need to get the job done — without the hassle of larger machines. UTVs are ideal for transporting or hauling materials to where you need them and are easy to operate. As Cat continues to expand the reach of its innovative product line and engineer equipment to meet your needs, your business will enjoy an increase in productivity. Thompson Machinery has the CUV82, CUV 85, CUV102D and CUV 105D UTVs for sale, available in gas and diesel models. Not only do the engines offer versatility and impressive performance, but they are also powerful enough to withstand heavy loads and are fuel-efficient to help you cut back on costs. Covering broad applications from industrial and construction to agricultural and governmental, UTVs encompass a rugged steel structure, able to take on the most challenging tasks. The vehicles also deliver superior handling, ergonomics and maneuverability in the most difficult conditions. Outside in the mud, rocks or clay, UTVs can deliver durability, reliability and productivity to help you efficiently tackle hauling and towing jobs. These Cat machines are spacious and comfortable with headroom and legroom to accommodate people of all heights and sizes. And with quiet operation, your workers can communicate with each other, as it also promotes a safer and more organized jobsite. Unparalleled Support: When you invest in a UTV manufactured by Caterpillar, you can rely on your authorized dealer for dedicated service and support. All-Terrain Abilities: Depending on the ground conditions you experience, your two or four-wheel drive or four-wheel drive/lock model will allow you to make clearance adjustments without sacrificing your equipment. Incredible Serviceability: You can extend the life of your UTV and obtain lower maintenance costs with filters, advanced onboard diagnostics and drive belts. Customized Capabilities: We provide more than 50 accessories to ensure your machine reaches its full potential in supporting your company. Options range from power dumps and front winches to weathertight enclosures. Ultimate Productivity: You can now transport more resources and heavier loads safely because of the UTVs’ steel cargo beds and smooth variable transmissions. Incomparable Stability: Both of the Cat models have a four-wheel suspension system, accompanied by a front sway bar for increased stability when operating at full capacity. 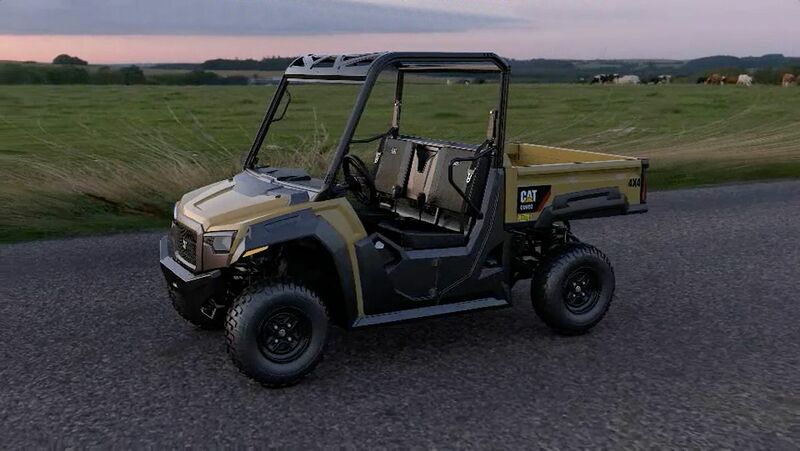 Compared to ATVs, the off-highway vehicles from Caterpillar offer more protection and can endure loads of supplies whether you’re moving rocks, dirt, sand and equipment or even if you need to get from one location to the next on your worksite. If a Cat UTV seems like a viable investment to support your operations, contact Thompson Machinery online for further information. Our experts are here to help you determine which model will work best with your applications and conditions as well as your budget.